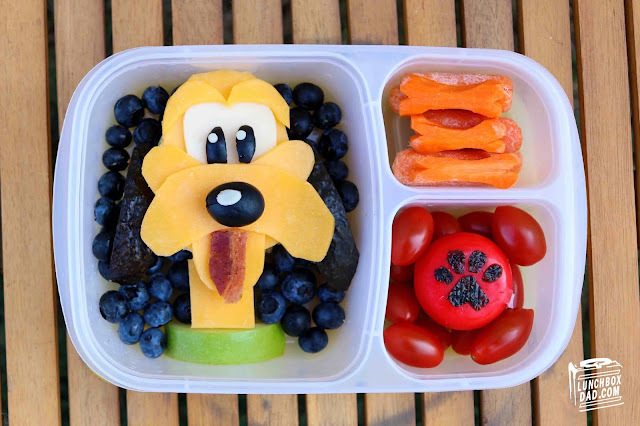 Is there any cuter Disney character than Pluto? I mean, he's always ready to play, is continually happy, and seems to constantly be up for an adventure. Sure he gets himself in the occasional jam but Mickey Mouse can't stay mad at him. It's just impossible not to love this dog. It's for these reasons that I thought my kids would love to get a Pluto lunch for school. 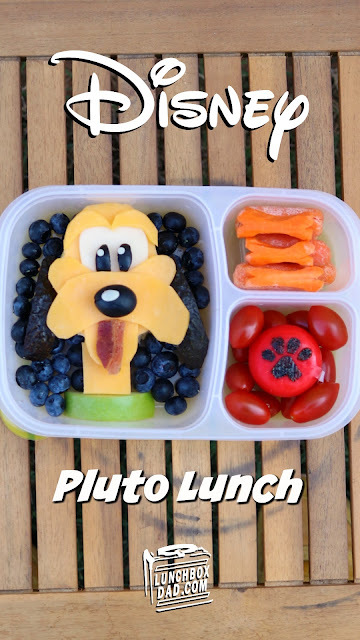 This Pluto sandwich lunch is basically just a few cuts of cheese, similar to my Donald Duck lunch. I also like that I was able to include a good amount of fruit and vegetables. I created it in an Easy Lunch Boxes container. See below for all the ingredients and directions! 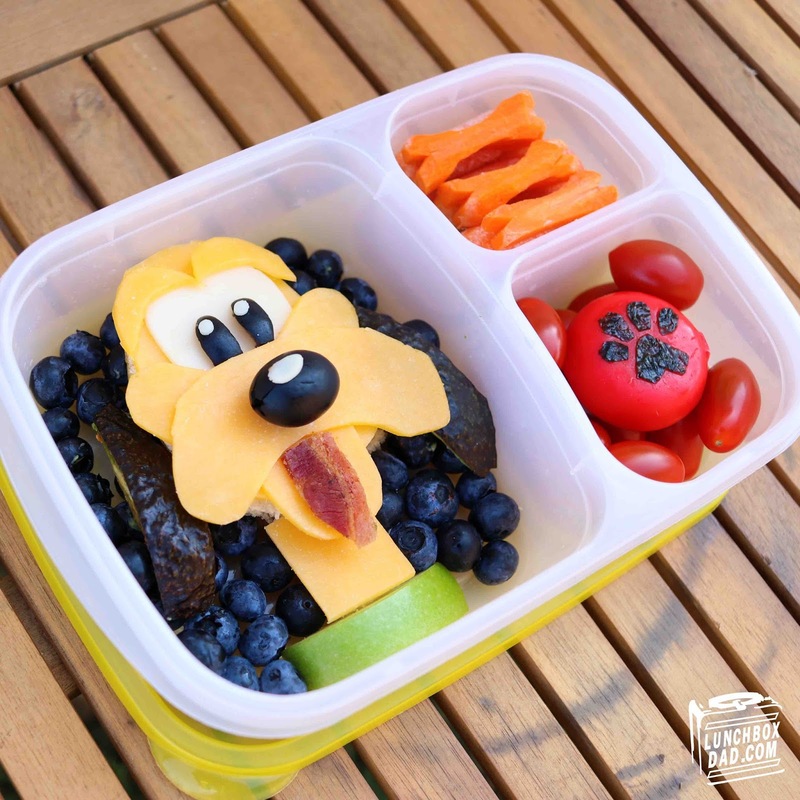 Ingredients: Cheddar cheese slice, Provolone cheese slice, black olives, bacon, whole wheat bread slices, avocado, blueberries, green apple slice, grape tomatoes, Babybel cheese, nori, baby carrots. 1. Cut two ovals out of bread. Put choice of filling between the slices. Cut one oval from cheddar cheese. Then cut two boomerang shaped slices and one half circle slice. Put together as shown in photos to create Pluto's mouth. Place small piece of bacon on top for tongue. 2. For eyes, cut half circle out of provolone cheese. Cut out two eyebrows from cheddar cheese scraps. Arrange as shown on face. Slice black olive into narrow pieces and set on top of white cheese for the eyes. Use a whole olive for the nose and stick on with toothpick. From white cheese, cut out two small circles and one small oval and place on nose and eyes. 3. Cut out two more small squares of bread and one small square of cheddar cheese. Place under face to make the neck. Put apple slice under neck for collar. Place a slice of avocado (skin on) on each side of head for ears. Surround with blueberries to complete main compartment. 4. In one side compartment fill with baby carrots. Cut three baby carrots into bone shape and put on top. 5. In second side compartment place Babybel cheese and surround with grape tomatoes. 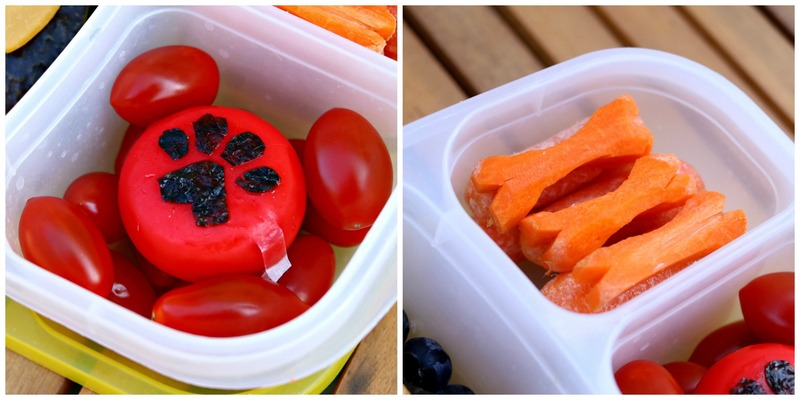 Cut paw print shapes out of nori and stick on the outside of cheese wax.